Home prices continued to edge upward over the last year in Greater Madison amid increased demand for homes and fewer listings in the area. The South Central Wisconsin Multiple Listing Service (MLS) has released its first 2015 report on home sales in Dane County, and early indicators show that the area’s housing market will continue its steady rebound in the year ahead. Demand for homes in Greater Madison remains high, and inventory remains low. There has been a steady decline in the number of homes listed for sale in Dane County over the last three years. The number of new listings in January was 7% lower than in 2014, and 14% lower than in 2013. Despite the continued drop in the number of new listings, however, the number of home sales hit a new eight-year high for January. There were 321 closings reported across Dane County. By end of January, there were 17% fewer active listings than in 2014, and 30% fewer active listings than in 2013, according to the report. What does that mean for you? Demand for homes has outpaced supply in Madison and surrounding communities, and that has helped fuel a steady recovery in sale prices. 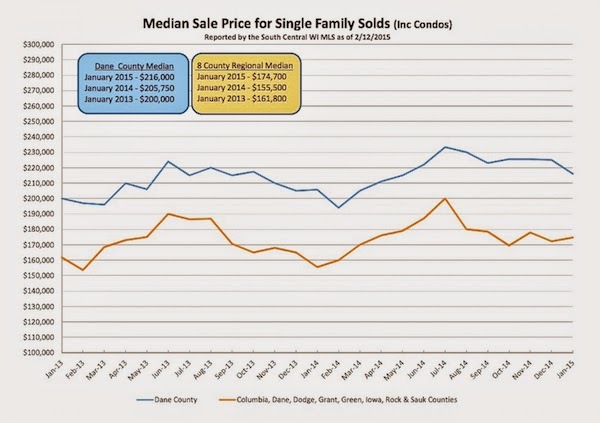 The median sale price in January was $216,000, an eight-year high for that reporting period in Dane County. The median price for the month was also up 5% from 2013, which is a promising development for both sellers and buyers. Higher sale prices mean sellers are able to rebuild equity in their homes. Single-family homes showed measured progress with a 1.8% increase in median sale prices from 2014. But the news for condo owners in Greater Madison was even better. The median condo sale price in January was $158,500, a new five-year high, and a 17% increase in the year-over amount, according to the report. Early indicators for 2015 hold promise for potential homebuyers, too. The year began with historically low interest rates holding firm, which makes home loans more affordable. Also, the steady recovery in sale prices means homebuyers can build equity and haven’t “missed out” on an opportunity to buy while prices are trending upward. Still, there are fewer homes on the market than in recent years, and those historically low interest rates won't hold for long. High demand for homes and fewer new listings has also driven steady recovery in sale prices across Wisconsin. Median sale prices statewide reached $135,000 in January, a 6.1% increase from January of 2014, the Wisconsin Realtors’ Association reports. The number of home sales across the state in January, however, marked a new three-year low for the month.